Y stands for entry-level phones in the company's recent naming system. Phones for youths and emerging markets. The Galaxy Y is at the bottom of the Android food chain. It joins the likes of the Galaxy Mini, the Gio and the Fit at the wide base of a pyramid that eventually peaks in the next flagship. There's a long way from the Galaxy Y to the company's top earners. It will appeal mostly to people who are new to the smartphone market and should rack up strong support for Samsung. Android with TouchWiz and the package of preinstalled apps and services offer a more complete mobile experience to people coming from a feature phone. And that's available at a rock-bottom price. No, the Galaxy Y has nothing to offer to experienced smartphone users. It's the experience builder for the next generation of Samsung customers. The company is taking the entry-level smartphone market seriously. The Galaxy Y joins a lineup of similar handsets. The Galaxy Mini offers a marginally better camera and slightly larger display. The Galaxy Fit boasts a 5 MP camera and bigger screen. However the Galaxy Y does offer the most recent release of Android Gingerbread and a higher-clocked 830Mhz CPU. HTC will rarely go that far down the Android ranks but their Wildfire S could be a major threat. Exactly the same size as the Galaxy Y, it offers far superior build quality, along with a better camera and display. And it isn't that much more expensive than the Galaxy Y. The LG Optimus Net is a fairly recent competitor running Gingerbread. It trumps the Galaxy Y with a bigger and better screen, an autofocus still camera and better video. More RAM and a dedicated graphics chip promise fluid handling too, though we're yet to see this one in action. Symbian is traditionally a place to look for mass-market smartphones. The 1GHz Nokia 500 failed to impress us but an upgrade to Belle could do a lot of good. The traditionally good feature set of Symbian smartphones is a strong point in favor. 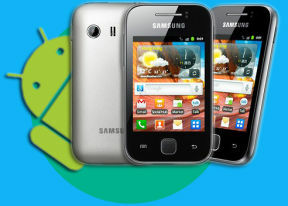 The Galaxy Y is the right handset if you're willing to give smartphones a try. There are other options too of course but if you're willing to enter on Samsung's side, the Galaxy Y is the closest and most convenient way in. Of course, in this price range you need to be ready to put up with some limitations. The important thing is you'll be getting the Android experience at a bargain price. And it's a bargain for both sides. Users get a cheap Samsung smartphone. Samsung gets users…well… addicted.